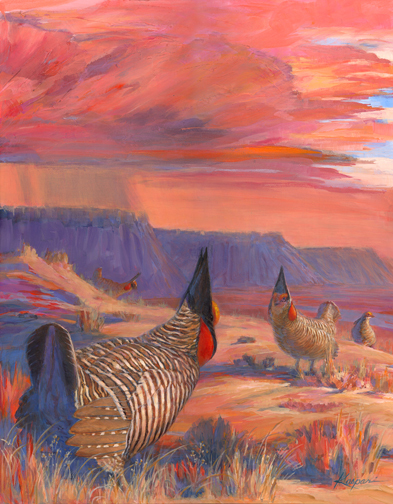 "Selman's Bluff" lesser prairie chickens, acrylic on board 16"x20"
I love finishing up a project that I’ve enjoyed so much; this is the image which will be on the poster for the Lesser Prairie Chicken Festival in Woodward, Oklahoma, April 17-22, 2009. I’ll be there giving a presentation: Big Adventures in Bird Drawing, and a drawing demo as well. This promises to be a delightful experience (the festival, I mean). There will be field trips to Selman Ranch for early-morning lesser prairie chicken-dance viewing (awesome), birding trips with expert guides (where you might get some new prairie species for your life-list), a ghost town night walk and owl prowl, a visit to a prairie dog town, even some good old-fashioned chuckwagon brunches. Sharon Stiteler, aka The Birdchick, will be the keynote speaker. Like I said, awesome all the way around. Oh, and I’ll be bringing along my banjo and picking some of those old tunes to round out your great western experience at the Lek Treks and More Lesser Prairie Chicken Festival. Hope you can make it! Very impressive. The subtle signs of sunlight on the Prairie Chickens, especially the nearest one, really add to it. And it does look like you enjoyed doing it. The festival sounds great. It sounds like a full ‘western experience’ for those lucky enough to be able to attend. Say, have you heard the new Steve Martin banjo CD? Is it “banjo worthy”? I’ve heard a few cuts and it sounds good to my untrained ears … just curious! Stunning! Love the interplay between the detail in the Prairie Chickens and the loose strokes of their environment. The rain shower in the background is a nice touch. Wish I could take place in this experience. Bucket list! Carol, I’ve got the new Steve Martin CD and it’s terrific- he’s a good, driving banjo player and he’s written some really tuneful numbers, which is pretty good when we’re talking about banjos :-). The other players on the album are super-stars like Tim O’Brien, Vince Gill, Dolly Parton, Earl Scruggs, Tony Trischka and Mary Black. It’s a genuinely fine album and I’m only sorry I downloaded it instead of buying the cd, because I hear Steve Martin’s liner notes are a hoot. So if you buy it, would you please send me a copy of the notes? Thanks for the good comments on the prairie chicken painting, all! Love this! The colors are stunning. Hope you have a wonderful festival. Beautiful!!! You’ve really captured the feel of that place. I cannot wait to go back. THIS IS A DREAM JOB! No gimmicks. No catch. Work from home whenever you want!